A closet-size room attached to Sandy Webster’s spacious home studio holds a pantry of natural earth-tone pigments used to color her handmade journals, prints, paintings, drawings, and other works of art. Shades of brown, green, red, gray, and yellow—it’s surprising that dirt exists in such a variety of hues. Some of the dry powders were culled from soils in France, New Zealand, and Australia, while others came from right down the road on the banks of Lake Chatuge. Sandy has traveled abroad many times to offer workshops in her craft, but while at home in Brasstown she teaches at John C. Campbell Folk School. During these courses, and the occasional class offered at her home, she takes students out to gather pigments. “It lets people fix this place on their work in a very physical way,” she explains. In Sandy’s art, place and time are recurring threads. Mementos, some as simple as a barbecue-stained napkin, are folded into art. She’s guided many students through this creative practice, which is meant to evoke a visceral response that can take you back to a moment in a way that’s beyond words. Just as Sandy’s pieces hold fascinating personal narratives, so too does the mountainside dwelling she shares with her husband, Lee. Not only does the home hold a gallery’s worth of handmade curios that reflect the Websters’ interests and travels, but the entire 10-month construction of the abode is documented through delicate drawings and collages that are bound in a handsome journal created by Sandy. The thin cardboard cover came from the first box of nails; illustrations of workers and amusing pieces of equipment are recorded in watercolor; and notes indicate when something was completed, where a material came from, or how much it cost. Though this is Sandy’s only effort at chronicling the home-building process, it isn’t the first house the couple has built. Since moving to Brasstown from Michigan in 1988 so Sandy could teach and study at the Folk School, the couple has acted as contractors for six dwellings, and they’ve lived in all but one. While there is money to be made in flipping houses, that wasn’t their only intent. In large part, the process was an effort to create their dream home. Three of the houses have the same 3,500-square-foot floor plan of their design, but adjustments—a longer deck, higher ceilings here or there, and more windows—were made to suit their wants and needs with each successive build. The resulting abode, built from Tennessee fieldstone, is quite the dream. At the end of a long, winding drive, a Japanese garden, replete with a fishpond capped with lovely lotus flowers and lily pads, sets the tone of a peaceful retreat. Off to the left is a small guesthouse where Sandy’s students sometimes stay. The gardens and beehives are Lee’s domain, and the Asian influence is an ode to the couple’s appreciation for Japanese aesthetics. 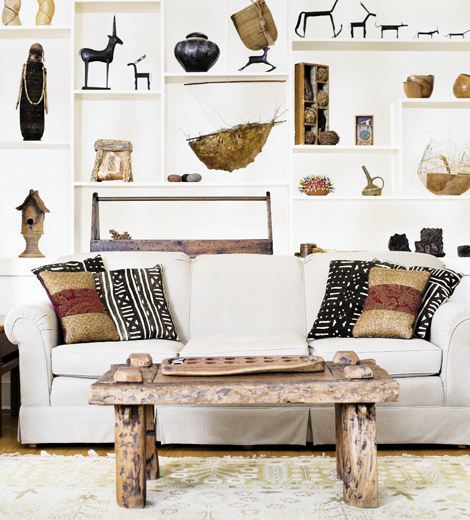 Inside the home, the couple’s penchant for art and culture is clear. Sandy’s delicate baskets, paintings, and curio cabinets can be found throughout, and a handful of exquisite wood-turned bowls showcase Lee’s handiwork. Other pieces were crafted by friends, purchased from artifact dealers, or collected during the couple’s travels. A soaring foyer displays Aboriginal artworks, a nod to Sandy’s nine trips Down Under to teach workshops in basketry, bookmaking, and more. One curious sculpture, a reimagined piece of scrap metal, was unearthed during the excavation of the homesite. And none of the art goes unnoticed. The walls throughout are a warm, off-white tint, a deliberate choice that puts the pieces in focus. Perhaps the most impressive display is the soaring custom shelving unit in the living room, which Sandy designed. Nearly two dozen cubbies frame worldly objects d’arte: leather shadow puppets from Thailand, a Zulu container from South Africa, museum-worthy Native American baskets, a model boat Sandy made from bamboo. Despite the stark walls, this is far from a sterile environment. It’s full of creative energy and is very much a functional home that is loved and lived in. The Asian-inspired master bath is Sandy’s sanctuary, while Lee enjoys making full use of the kitchen. A small den is where he watches sports matches, and Sandy’s light-filled studio is any artist’s dream. But the space that sees the most use is the 50-foot screened-in deck that stretches the length of the house and affords long-range mountain views. It’s a relaxing setting bathed in gray and teal with lime green accents. Lee built the custom recliner swing made for two. And when entertaining guests, the metal bar and stools are put to use, as Lee is quick to offer up a pint of his own homebrew that he keeps on tap. Though the Websters host guests and friends from the Folk School on a regular basis, Sandy and Lee laugh when they talk about one of their first gatherings in their new space: a housewarming party to thank all who had a hand in building their dream home. Sandy made 50 personalized invites using images from her book that pertained to each person’s contribution to the home. As requested by the workers, large quantities of Bud Light and meatballs were laid out, but to the Websters’ disappointment, only four people showed up. “Lee and I drank that lousy beer for months,” she says, laughing and shaking her head.